More than 20 years ago, A.P. de Silva (University Belfast) combined Boolean algebra with chemical sensors for the first time. With this seminal approach he merged classical chemistry with digital information processing. The term ‘molecular logic’ was introduced for the first time. 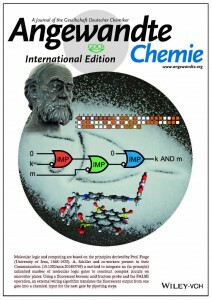 Information processing with molecular logic gates was connected with the digital interpretation of conducted experiments. Nowadays, chemical logic gates are still chemical sensors in most of the cases. Unbound and saturated states yield discrete and digital output behaviour similar to digital electronics. New applications of molecular logic have been demonstrated, such as information storage, smart materials, delivery/activation of drugs, clinical diagnostics, or even playing games. Following the ‚Begriffsschrift‘ of Prof. Frege (University of Jena, 1848-1925) scientists are working on the challenges of molecular logic and computing. Especially combining many logical gates to construct complex circuits is hindered by the “concatenation problem”. We addressed this issue in 2014. A protocol to integrate an (in principle) unlimited number of molecular logic gates to construct complex circuits was presented on microtiter plates. These circuits have been reinterpreted by using the functional completeness of the molecular implication function of a fluorescent boronic acid fructose probe and the FALSE operation. An external wiring algorithm translates the fluorescent output from one gate into a chemical input for the next gate via pipetting steps. M. Elstner, K. Weisshart, K. Müllen, A. Schiller, J. Am. Chem. Soc. 2012, 134, 8098-8100. JACS Spotlight: J. M. Perkel, J. Am. Chem. Soc. 2012, 134, 9535-9536. M. Elstner, J. Axthelm, A. Schiller, Angew. Chem. Int. Ed., 2014, 53, 7339-7343. Urheberrecht © 2019 Schiller Group. Alle Rechte vorbehalten.